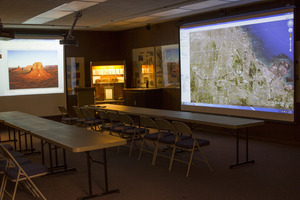 The Blue Island Public Library has two meeting rooms available for use by the public. We have a smaller conference room suitable for up to 12 people and a larger meeting room that can comfortably hold up to 40. Please note that the rooms are not available to commercial/for-profit organizations, for religious worship or private, personal social events. Please see our Policies Page for the complete policy. Applicants are expected to read the policies before completing a request. Meeting rooms must be reserved a minimum of 7 days in advance and all applications are subject to the approval of the Library Director, and, when applicable under the Meeting Room Policies, the Board of Trustees. The Library does not necessarily endorse the philosophies or practices of the individuals, groups, clubs, or organizations that use the Meeting Room in the Library. The Library is not responsible for the content of third-party programs. Fees are to be paid prior to room use and are as follows: $10/hour for Blue Island Public Library cardholders and $20/hour for NON Blue Island Public Library cardholders. Fees are reflected in the Meeting Room Policy.